Hey everyone, just as a quick post I wanted to let you guys know that I finally got my hands on an oculus rift. I’m pretty excited to play around with it, though I’m not sure what exactly the scope of the work I’ll be doing with it yet is. As it stands, it’s really cool tool to just explore and get a feel for virtual environments. As far as mechanics goes, it’s a pretty tough nut to crack. For now, I’m mostly going to be plugging in different 3D worlds and walking around them to see what feels good and what gives the most interesting reactions. A few weekends back, I participated in a HOG jam. HOG is the House of Games organization, and the game jam theme was ‘Games for Good’. This was a pretty interesting theme, as I had never done anything remotely similar in any other game jams before. After the initial introductions, I jumped on a team with an artist I worked with on both Douse and Lignum, Constance Chen. We immediately started brainstorming ideas when we sat down, and I can safely say that the first couple were not prize winners. We kept mulling over this idea and that one, the implications of each one, and whether or not it would actually be doing good. After about an hour of a half of that, we were both spent. With the last bit of creative whimsy left in my brain, I blurted out the words ‘kids with credit cards’. Constance was quickly sold on it, and off we went designing a game around teaching children about finance. 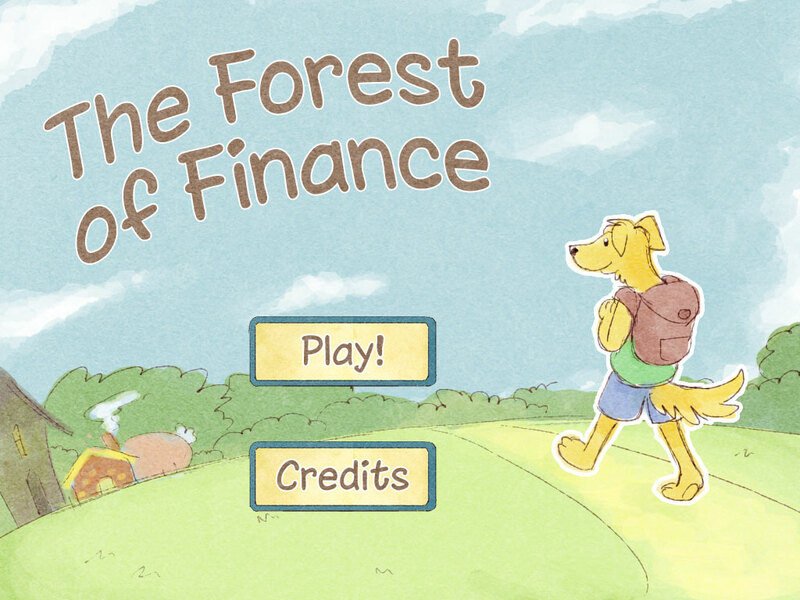 The game itself is pretty simple: A point and click adventure akin to “Putt Putt” games that’s meant to teach kids about the basics of finance. It covers topics like credit cards, loans and interest, and taxes. It’s not meant to be overly heavy handed, but just introduce the basic concepts. Though time didn’t allow, I would’ve had a little bit of interactivity in each area, showing rather than telling each concept. The actual creation of the game went smoother than any game jam previous. I planned out the general layout with Constance and immediately went to work creating it. An initial obstacle for me was creating the text boxes. I didn’t have experience with too many GUI plugins, so I decided to just rough it out the best I could. I had to find solutions to things like word wrapping and text size and placement as fast as I could, but once that was up, I got to focus on the little bits of interactivity we had budgeted out. We were working on a ‘at least get to this point then reevaluate’ sort of basis when it came to features. With the velocity that I ended up having though, we ended up with a nice handful of extra bonuses we hadn’t initially planned for. After the 48 hours, we were finished. We got to do a nifty little presentation in front of everyone else there, and it felt very well received. Constance’s art has a great style to it, and gives the game a charming feel. We didn’t end up winning one of the two spots, but one of the judges stopped by to tell us that he enjoyed the game quite a bit and we were a close third. The website and subsequent game can be found here. It’s definitely a simple game but it could definitely be something interesting if we expanded upon it, who knows what the future holds. The level on the first playthrough. 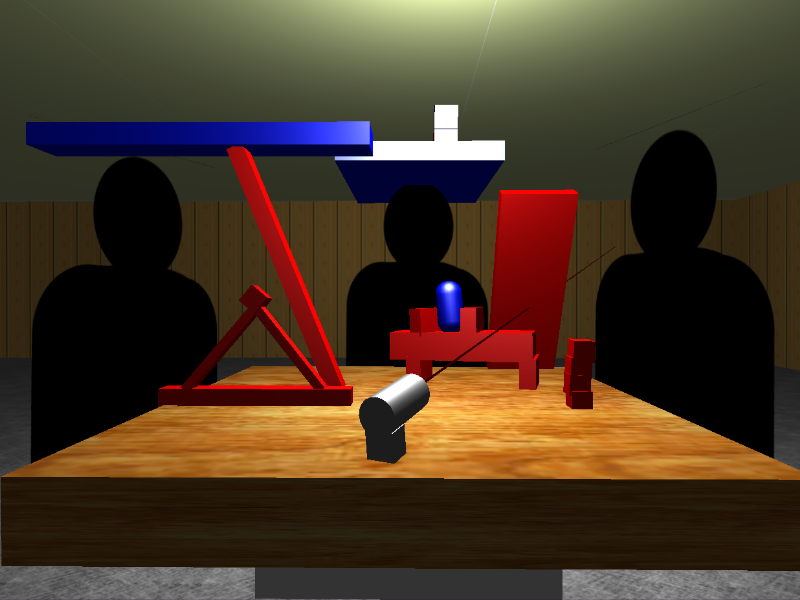 The initial thought with this prototype was a level whose difficulty could be dynamically adjusted. The first idea was to let the player do it himself in return for better scores or points, but I went with a simpler approach, and made it progressively difficult on each completion. The first aspect that I tweaked was simply platform size, which is pretty apparent in the pictures above. This was easy enough to do, and ramped up the difficulty a bit. After that, I added in spinning, red crosses. Touching the cross instantly kills you, and since one side is longer than the other, getting past it requires a certain rhythm. This windows continually shrinks as each time you beat the level, they spin faster and faster. The last obstacle was the orange platforms. They simply move up and down at an increasing pace. Overall, I found the prototype to be successful, but not viable. Repeating the same level over and over, regardless of any variation in difficulty, simple wasn’t proving to be engaging enough. I decided that if I were to ever use the idea, it would be a smaller component of a larger game. This prototype came from wanting to giving a tactile feel to manipulating a level. 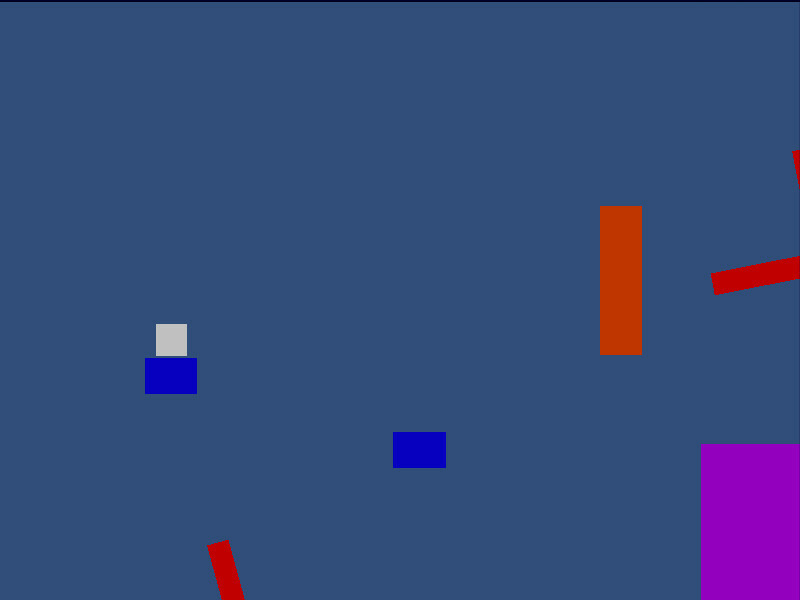 The basic concept is having a ship move across the screen without getting destroyed.You don’t actually control the ship itself, but all of the obstacles in its way. It’s controlled by using your keyboard like a piano. Each key, A S D F H J K L, corresponds to one of the platforms, and pressing a key raises the platform temporarily. There was also a simple song that was intended to sync up with the position of the ship, making it a little easier to know when to move the platforms out of the way. To circumvent players from just holding all the keys, I initially had two ships going, one above and one beneath. The prototype was a bit rough and complicated, and it definitely didn’t turn out the way I was hoping. While I liked using all of my fingers to control the level at once, it quickly became hard to manage. With the time frame I was working in, I also couldn’t get sound syncing in, so I left it out. It turned out to be a clunky idea, but I definitely learned quite a bit working on it. This one was pretty interesting for me, as the idea for navigation with limited sight had been bouncing around in my head for awhile. 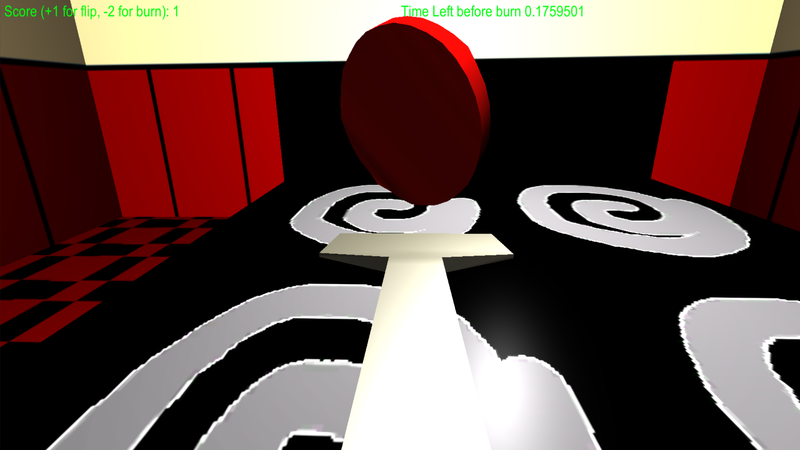 The screenshot might not look like much, but that’s the point of the prototype. Playing it requires headphones and focus, as you have to find the source of sound in each room, using only your ears. 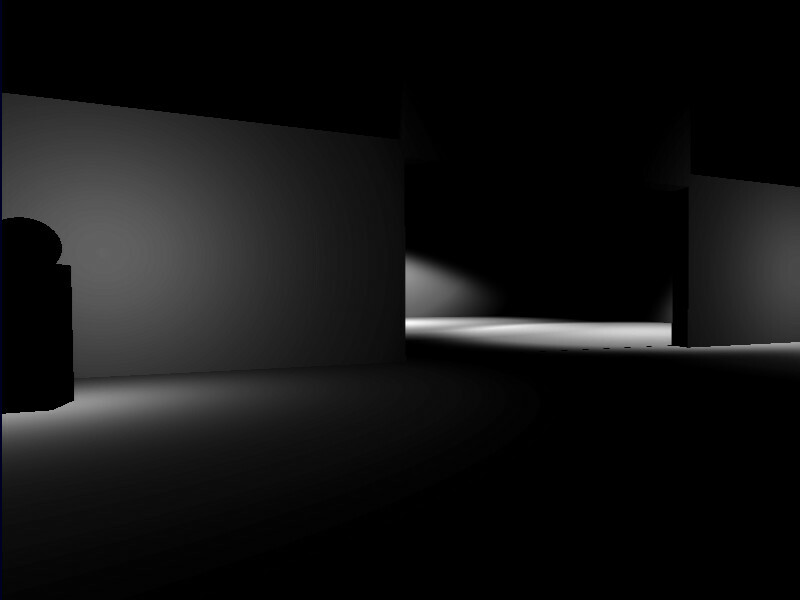 The amount of light available in each room gradually decreases as you get a better feel for the mechanic. In execution, I was actually quite happy with this one. Playing it was pretty interesting, and it definitely rewarded mastery and patience. Anytime I tried to rush through, I’d always get lost, but simply slowing down and focusing easily got me back on track. I actually ended up working on this particular prototype longer then the others. The first iteration was interesting, but unexplored. After talking to my professor, I was able to take more time to develop and flesh out this particular mechanic. I created a couple different rooms with varying structures, and varied the sounds as well. My professor liked it quite a bit, and encouraged me to try and find it a home at some point in time, which I most likely will. Thought I’d give a quick update on a gamejam I did a little while back for LD28. The theme was “You Only Get One”. The concept of the game is pretty simple: You get one bullet from a simple little gun, and you have to cause as much destruction as possible. It’s a physics based game, so it’s not always entirely reliable, but it’s a pretty fun little experience. The main take away I got from this project was being able to have a full arc for a game jam. 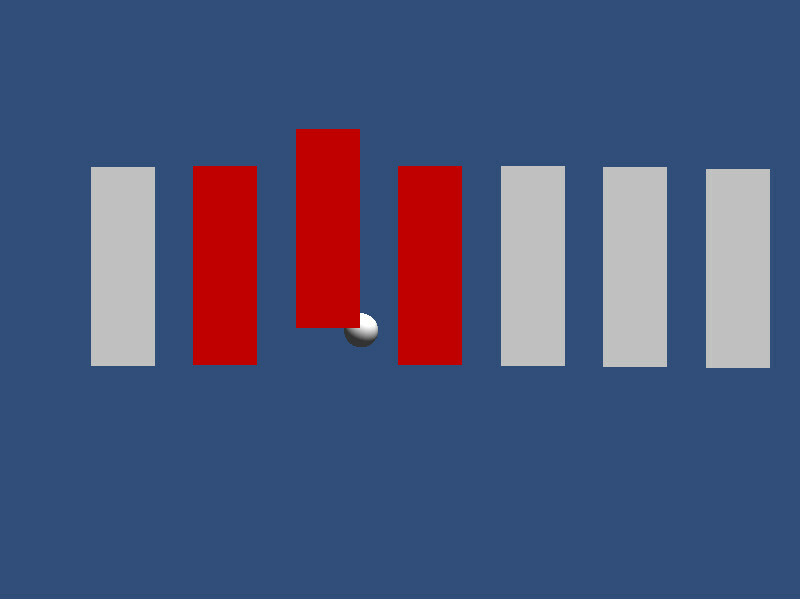 My first game jam, Neon, was a neat mechanic, but no game. The game jam after that, the burger flipping one, had levels and points. Now I had a little bit of everything, and made it a bit more of a cohesive experience. If you’re interested in playing the game, you can find a link here. So its been a little bit since my last post, but I’m going to be posting quite a bit more now that I have a bit of time. My internship lasted much longer than anticipated, and between that and classes, I haven’t had much time to post on here. That isn’t to say that I haven’t had been doing lots though! -Game jams! I did two more since my last post, consisting of a Ludum Dare and a game for good. -Game projects. I’m taking Lignum and porting it into Unity, specifically using Unity’s 2D toolkit, so there should be some zany adventures to go along with that. -Game design. I did an independent study last semester focused on rapid prototyping, so I have a handful of fun little trinkets to show everyone. Hopefully there will be some new content around here a bit more often, and I’m looking forward to it. See ya’ll then! Since I’ve been on a gamejam kick lately, I decided to try my hand at a Ludum Dare comp this weekend. I got so swept up into it I forgot to post that I was starting it. Well anyways, I gave it a go and actually finished it! Unlike my 7DFPS, I finished this one front to back. There’s a win condition, points, and nice sound effects. Unfortunately no soundtrack this time, as I didn’t end up having time to make one that fit with the game. Overall it was a great experience to go through. I took it at a much slower pace this time. Mostly that means I didn’t immediately start programming the second the jam started. I tried to write down a couple ideas and chose the one that spoke to me the strongest. The theme for the compo was ’10 seconds’ so I initially came up with a couple stale ideas that would come along with that theme, but I rejected them in favor of something a little more ‘out of the box’ like. That being said, I’m sure those same ideas I cast aside could have made much better games than what I ended up accomplishing, I happen to be a fan of experimental and fringy games, so I try to go there as often as possible. A burger sim is nowhere near any of that, but I had initial intentions of it being so. When I first sat down in Unity and started to bust out two pieces of panic hit me: I had to use Blender instead of Maya for 3D modeling and I had never used Blender previous to this, and I had no battle plan for how to implement my main mechanic. The Blender problem was half solved by an option to change the camera and selection controls to Maya-like, but that didn’t help too much as there was just too many actions I had to know how to do that I couldn’t quite figure out on the fly. I did, however, end up getting two models out of the process, so it wasn’t all bad. I plan on going back and properly learning Blender when I have a chance. Regarding the mechanic, that was a bit of a challenge. The mechanic required that I was able to pick up a hamburger patty and flip it. The problem came when I had the spatula control implemented. Because I used a kinematic object and position changing, the friction wouldn’t hold the patty to the spatula, (at least that’s my best guess), so I had to think of an alternate way. The best solution I came up with was putting a small small sticky portion onto spatula that would create a weak fixed joint to the hamburger patty so that it would follow the spatula and naturally flip when it had to. For the most part, it worked as intended. I ended up having to add a cooldown to the sticky portion because it would constantly double stick and prevent the patty from leaving. If you play the demo, you may notice that even it it’s final implementation, it isn’t perfect and can be a bit spotty, but for a 48 hour demo, I’m proud of it. The rest of the game just fell into place after that. Instead of trying to complete the theme and make an entire hamburger, I just went for a quick and dirty up the ante approach. I did want it be a bit more grandiose, and some last minute code got thrown out that would have helped it a bit. I was sad to find myself out of time to create a soundtrack for the experience as well. I know how important music can be to an overall experience, so next jam I will make sure to allocate some time to one. One neat thing that I tried this time was time lapsing my entire process using a piece of free software known as Chronolapse. A link to the actual game page can be found by clicking the picture above or right here, and the lapse is posted below. PS: I’m starting some interesting work on a side project, so you guys might get to see some awesome details down the line. I know this may look like a duplicate post, but I finished my 7 DAY FPS today. I definitely did not get enough time to work on this, what with the internship and personal things coming up, but I still managed to add on a bit more to it, and it’s slightly more of a complete experience. I had a ton of fun with it, and honestly, that kind of hindered me developing it. I had so much fun just playing around with the basic mechanic, I had trouble thinking of anything else to add to it. It became just a nice little past time that I would play around in when I had the chance. This is a great lesson for me going onto further game jams and development in general. Idly enjoying a mechanic can prevent better ideas and mechanics from growing and thriving, and I need to watch out for that next time! (Psst, I’m going to be trying to do Ludum Dare next week, stay tuned!). One of my favorite parts of developing Douse and Lignum was creating, aligning, and maintaining the vision for the game. This is something I wasn’t quite expecting when working on game jams; mechanics became the rushed centerpiece. Because of the time constraint, I had neglected to create any sort of vision or overarching theme for the game, which ended up hindering me later. While rapid mechanic prototyping is essential to game jams, I think that next time I’ll at least try and have some sort of magical idea I can draw strength from. Anyways, if you’re interested in giving the game a whirl, a link is right here. Again, all it needs is Unity webplayer and is played in browser. Have fun! Also! I have twitter now! I added a small widget on the sidebar if you’re curious.